Sony went head first into confirming future plans first thing this morning before PMA had even officially begun. 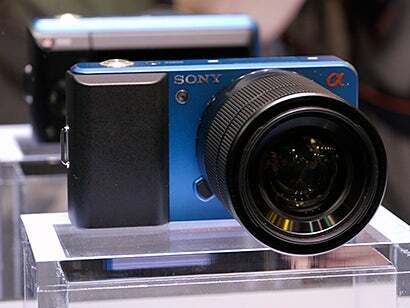 At the conference it was confirmed that a new mirrorless interchangeable system camera Alpha model – presented as three individual red, blue and silver-bodied prototypes – would be a new direction of focus for Sony. Unlike Micro Four Thirds cameras, but of a similar ilk to the Samsung NX10, the new Alpha will have a large APS-C sized sensor to produce DSLR-like image quality but from a small and light body. However, unlike the current Exmor sensors the new APS HD CMOS sensor will, for the first time, bring Full HD 1080p AVCHD video to the Alpha stable – a direct challenge for the likes of Panasonic’s GH1. In addition the DSLR-front saw a prototype A700-replacement on display – a camera that initially would, so it seemed, not make its way back into the range but is now set to be the first Sony DSLR to come complete with a movie mode. The same sensor type and video performance from the mirrorless Alpha will feature in future Alpha DSLR cameras, making 2010 will be the year video finally reaches the Sony DSLR range.